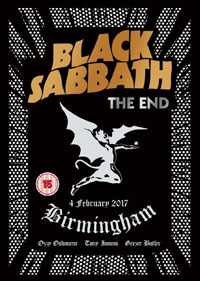 Share the post "DVD review: BLACK SABBATH – The End"
Black Sabbath’s Birmingham show in early February was billed as the band’s last ever. It has been captured here for posterity, as was always going to be the case. Whether or not it really is The End remains to be seen, but this is a decent enough testament to mark an epic tour. For the most part it is a well shot and well directed concert experience. The format is a straightforward run-through of the gig – interviews that were interspersed in the recent cinema screenings are absent here. There is a sense that the director has had to employ every trick in the book to provide a visual spectacle (flames/fireworks and the giant screen backdrop are thrilling if you are there, but don’t work well on DVD). That is probably because, apart from Ozzy’s meanderings (physical and verbal), there’s not much animation from the band. Tony Iommi and Geezer Butler are only rarely caught looking up from their instruments at the crowd, let alone at each other, or actually moving. There are plenty of great close ups of Iommi’s plastic-fingertip fret-work and Butler’s jazz-infused hand-offs. And Ozzy is generous with the mock horror looks and theatrical gestures. The clown prince of darkness is in fact on great form. The voice was more intact throughout the tour than many commentators had feared – only on a few bars of ‘Hand of Doom’ does he truly crack and splinter. By the time the stunning ‘War Pigs’ is unleashed, the box of editing tricks is plundered deeply: suddenly we have a blizzard of fast cuts, super zooms, split screens, blurring, multi-layering… It’s a touch too much. The DVD sound, on the other hand, is excellent. The spine-tingling opening of ‘Black Sabbath’ captures the sense of anticipation within the crowd and then we march on through a string of impossibly dark, rumbling and down-tuned greatness. Some of the highlights are expected, others are a surprise. ‘Snowblind’ is a real treat with Adam Wakeman’s keyboards adding colour and flavour; and ‘Dirty Women’ features some of Iommi’s most fluid and scintillating soloing of the show. Amongst the more obvious classics, the sights and sounds of the audience participation on ‘War Pigs’ are pinch-yourself, I-was-there moments; ‘Iron Man’ is thunderous – Tommy Clufetos behind the kit hits the skins like a man possessed; and of course ‘Paranoid’ is a riotous party closer, ticker tape and giant balloons almost obscuring the stage. This entry was posted in All Posts, DVD REVIEWS and tagged Bill Ward, Black Sabbath, documentary, DVD, Geezer Butler, heavy rock, live, Ozzy Osbourne, review, The End, Tony Iommi. Bookmark the permalink.